From Petricore Inc. and Thumbspire, Gelato Flicker challenges players to serve as many ice cream cones as possible by swiping to send the right ice cream scoops to the right cones at the edge of the screen. 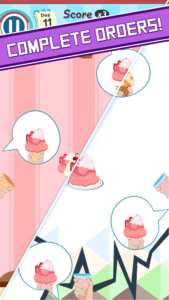 When a single customer wants more than one scoop, players may need to tap on the screen to change the order of the ice cream scoops in the center of the screen to ensure they stack the scoops in the right order on the customer’s cone. Games continue until players run out of time (they receive bonus time for each scoop they correctly serve), or until they give a customer the wrong ice cream. As players fulfill orders, they progress through business days, and will reach checkpoint days along the way. In future games, players can begin again from day one, or continue from one of these checkpoint days.